Inspired by summer creeping up around the corner and a couple of fantastic surfing videos on the new-look Total Gym website, this month I decided to write an article for our Total Gym owners – how to use Total Gym to train surfers. 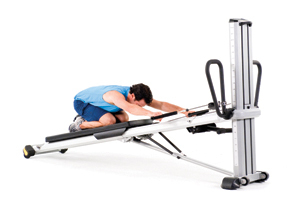 Many of the exercises came from GRAVITY Master Trainer Jeff Groh, which you can view on the Total Gym website. Click here to view videos (note: these are alphabetical – click the right arrow twice to get to ‘S’). The models in the pictures below are Nicole Decker, Rob Glick and Jeff Groh. To achieve functional strength, the muscles of the upper body, lower body and core have to be trained in a way that translates directly over to the sport in a synergistic manner. While isolation in some cases is necessary (core, beginner, rehab, etc. ), primarily the athlete should be trained using exercises that challenge a combination of muscles – to replicate how they are challenged while surfing. This is necessary to improve or get the edge on a competitor…and is what separates the winners from all others. 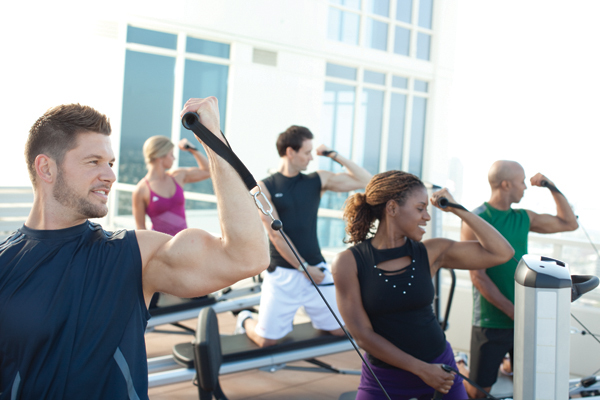 As a personal trainer you want to give your client the most effective workout possible. However the time spent changing machines and moving to different areas within a room eats up time and disrupts what should be a time-efficient yet still challenging experience – particularly with professional athletes. Total Gym ticks all the boxes because it enables you to work within a small area (a “pod”), maximising both your time and your client’s. In regards to the surfer it offers stability challenges, has core integration in most exercises, offers seamless strength transitions and near-unlimited advancements to ensure continued progression. Total Gym has incredible functional applications to almost any sport, and when it comes to surfing it is ideal for replicating many of the real-life actions of the sport. And you don’t need to be an expert at surfing – you just need to understand the movement patterns and functional strength required to develop in the sport. Not sure what functional strength is exactly? Click on this link to read a great article by friend and colleague Dean Quirke – Understanding the Principles of Functional Training. The added benefit of Total Gym is it is the perfect training tool not only for able-body surfers, but also surfers who have some kind of limitation or disability and are restricted by the equipment they can use. Following are some functional exercises for the surfer using Total Gym. As we lead into summer there are loads of opportunities to start developing programs and promoting to attract novices who are ready to get back on the board or professionals who want a leading edge. PADDLING – Surfer Lat Pull. This popular exercise is a great way to challenge the lats/back while integrating the core, increasing the strength and endurance required for paddling out, or just prior to catching a wave (modification-high kneeling). Strengthen the back musculature and arms in a swimming motion for muscle endurance. 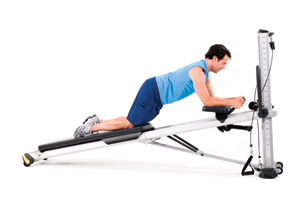 The unique thing about Total Gym is the glideboard – allowing the surfer to replicate the movement with resistance. PADDLING – Prone Reverse Fly with Back Extension. Again, strengthen the back musculature with another great exercise. This position has more focus on scapula retraction and shoulders. 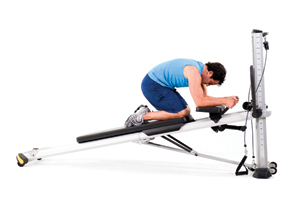 Incorporate as little or as much back extension as the client needs. DUCK DIVING – Dive Bomber. This exercise replicates duck diving under a wave or popping up on a surfboard. It could be likened to a pike, however it is quite different. The starting position has the heels raised and a neutral core position. 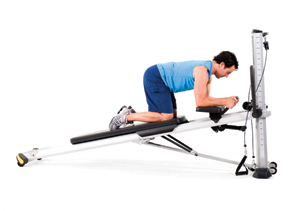 The client ducks down towards the board, and moves into back extension. 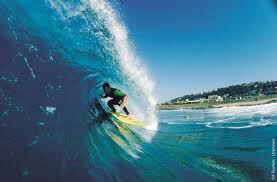 This translates into functional strength for surfers ducking under waves. POPPING UP – Prone to Quadraped. While it is not safe to pop up to a standing position on the glideboard, you can pop up to a Quadraped position which is still a great stability challenge. Direction comes from the trainer (call out “pop up!”). 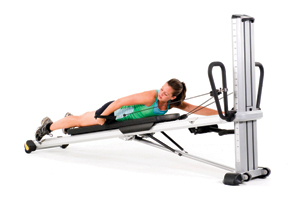 A great method is to have the athlete performing a swimming motion on the glideboard lying prone (left), then the trainer calls and the athlete moves into the quadraped position (right). POPPING UP – Drop Squat. While there are a number of squat variations that can be performed on Total Gym, all ideal for lower body functional strength for a surfer, the drop squat in particular is unique as it mimics the concept of popping up and landing in a flexed position. It also protects the knees while still providing the necessary challenge required. This is different to a normal squat in that the knees pop up, then land in a neutral position as the feet land on the squat stand. Holding additional weights at the upper body increases the challenge. With the SCRUNCH® accessory, you can achieve an incredible core-targeted workout. SCRUNCH® elevates core training by allowing the athlete to stretch, strengthen and stabilise the entire core and trunk for a targeted abdominal workout. This is of great benefit to the surfer who needs to acheive optimal core strength to effectively manoeuvre the surfboard. 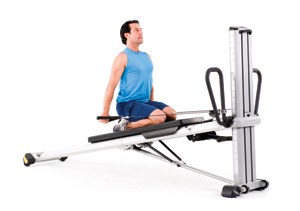 There is a lot of shortening of the abdominals and hip flexors with the SCRUNCH exercise, so Total Gym allows the athlete to round out again by assisting an incredibly effective and deep hip flexor stretch. 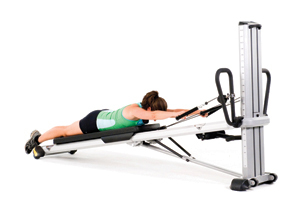 The glideboard allows for a dynamic stretch option so the athlete can move deeper and deeper into the stretch as required. The Hip Flexor stretch can be modified into a 3-dimensional stretch by adding arm drivers in the sagittal plane, frontal plane and transverse plane. This offers an incredible variation with the movements, opening up the entire body and rounding everything out again. A surfer is often in a flexed position and the spine will relish a release. Horizontal and vertical mobilisation is incredibly effective for this using the correct sized foam roller (100mm diameter). 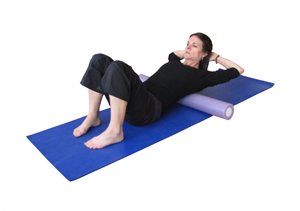 Click here to download a Foam Roller article for more about this. 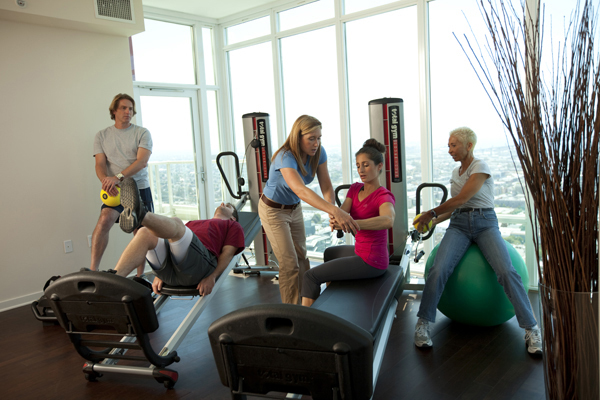 Total Gym is an exciting piece of equipment due to the diversity and endless possibilities. Not only can this single piece of equipment achieve well over 200 exercises, you can add other training tools to enhance an exercise or further increase the exercise possibilities. For enhanced strength incorporate Dumbbells, Kettlebells, Medicine Balls, Weight Bar, Plates, and more. 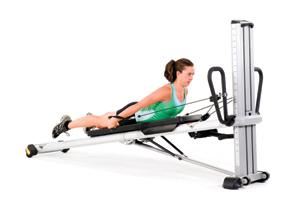 For increased functional stability incorporate a Suspension Training tool or Cable Machine. For stability challenges incorporate BOSU, DuraDisc, or any other unstable platform to use with Total Gym. 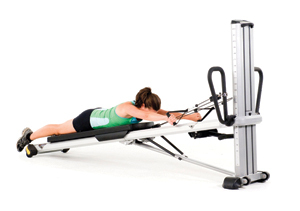 The glideboard is also adjustable – it be positioned from an incline to a horizontal position to act as a bench and it can be positioned at the ground level for evolved Pilates work. The possibilities are endless. The rest I will leave up to your imagination! The exercise prescription for surfers to achieve their goals needs to be functional, compound movements that challenge the entire body to achieve the necessary levels of strength, mobility and flexibility. And, most importantly, these need to translate directly over to the movement patterns of surfing. If you’re a Total Gym owner – then you’ve got a great way to achieve this. Click here to download this article in PDF format and view a breakdown of each exercise including more images and progression options. Shara began her career in the fitness industry at Les Mills Dunedin in 2005 and from there combined her passion for fitness with her strength in business to create a niche role for herself specialising in “the business of fitness”. Shara has consulted for gyms and small studios, developed an indoor cycling program, and continues to work one on one with fitness business owners as a sideline passion. As business development and marketing manager for HQH Fitness, Shara is focused on business development, company strategy and marketing. There has been a significant shift within the fitness industry over the past few years with Small Group Training growing in leaps and bounds. In the age of quick information where trends travel fast, savvy fitness professionals are getting on board with their entrepreneurial spirit by realising the benefits of training more than one client at a time. And when you look at bottom line, Small Group Training makes inherent sense. Total Gym®, one of the first international fitness equipment companies to truly embrace the Small Group Training model, brought this concept to the forefront of peoples’ minds when they launched their commercial product line in 2003. With their education programs centred around Small Group Training on Total Gym, fitness business owners everywhere quickly recognised the benefits of this highly profitable and time-efficient training model. In the following article we break down the Small Group Training model and take a closer look at this new phenomenon that is transforming fitness businesses around the world. 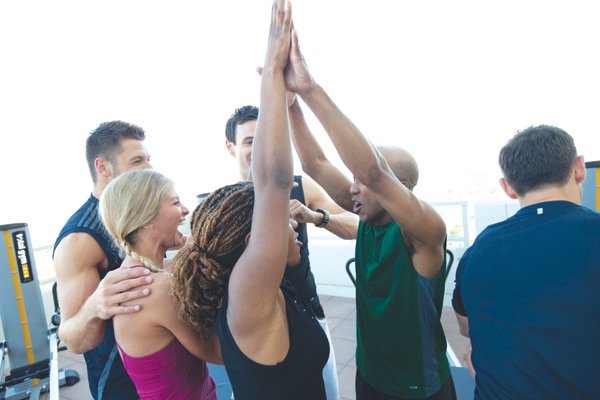 Team Training offers camaraderie – a group of individuals getting together for a common purpose. With a general target of 4 – 12+ participants, this is most commonly a pre-programmed approach which may or may not be musicality-based. Different approaches fit within this model including Circuits, Stations (e.g. 2×2 or 3×3), 50:50 set up (e.g. Total Gym and Spinning), as well as Bootcamps or Challenges. Payment is low per person, anywhere from around $10 – 20 per session (depending on what your hourly target is), making it incredibly affordable for clients. Fiona Caddies of FiTraining, Australia, has set up her studio with the Team Training model in full effect. She uses two Total Gym Classic PowerTowers, TRX, spinning, dumbbells, Bosu and other training tools to train multiple clients at a time. As a result, she ensures that she lives the lifestyle of her dreams. “I have a four day weekend, every weekend. It’s a great lifestyle choice.” Says Fiona. Click here to view her story. So…if you’re on board the Team Training approach the question is – how should you charge your clients? The class model is based around the “pay per session” concept, with the most common method being via concession card. Whilst this leaves it open for clients to drop in when it suits them, it means that attendance is uncertain and income is dependent on all booked clients showing up. This is an unstable model that results in fluctuation in attendance and income, which can be highly affected by seasonal changes. This makes it difficult to run a business with any form of consistency. The Program Model is centred on certainty and is the recommended option. With a general target of around 4 – 8+ participants per program, payment is made either in advance or by direct debit / AP. Each program has a start and end date, often 4 to 6 weeks in length, and shows active progression. Within this model your payment per session is guaranteed and the client is more motivated to attend. In addition, by offering “make-up” sessions every week, you increase the buy-in at the beginning and ensure that your clients have the opportunity to make up any session they may have missed, but you still get paid for each and every session, regardless. You can also use this make-up session to invite any leads to experience a free session – making the most of your time. The Program Model also works well in conjunction with the Waterfall Structure – which has been promoted heavily by Total Gym after the success of this format was seen in a US gym. So there are obvious benefits in taking a Team Training approach, but what about Multi-Client Personal Training? Where does that fit in? The distinction between the two is quite important to your business – firstly in how you position yourself and your business, secondly (perhaps most importantly) how much you charge per session and thirdly, your preferred method of training. So now we take a closer look at Multi-Client Training. Multi-Client Training is Personal Training on a slightly larger scale. Very different to Team Training, Multi-Client training is about training around 3-4 clients at a time based on their individual needs. By creating “pockets” for each client, you break each individual down into their goal, needs and challenges, and tailor the session to each individual – replicating their goal in their exercises. This training format is more time consuming as the preparation is personalised and not as generic as Team Training tends to be. The key challenge of Multi-Client Training is working with different clients, health histories and goals and personalising the session to each individual – all in the same room. So what are the benefits of Multi-Client Training over Team Training? You can charge more per person than you would in Team Training, anywhere from $30 – 50 per 45 or 60 minute session (depending on your one on one charge out rate). This is because you are still giving a one on one training approach in your session and offering personalised attention. 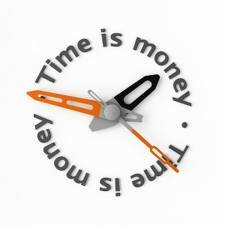 At the same time you are still charging less than your charge out rate for a one on one session, making it more affordable for the client. By creating “pockets” or “pods” for each individual, you have each client working in their own area and you can simply rotate from client to client to help them set up each set and monitor their progress. You can stagger the starting times, meaning that you can bring one client in at a time, set them up, set their agenda for the session and have them start while you bring the next client in – maximising your time with each client. You empower and educate the client. One true benefit is that clients learn how to execute exercises properly and monitor their own form and function. For those who are happy to embrace this type of education, it is truly invaluable to their wellbeing as you teach them habits for life. David Snively of DBS Fitness, Canada, is the owner of four Total Gym Classic GTS units and is the master of Multi-Client sessions. “It really works well from a business perspective and from a strategy perspective.” says David, whose business is completely built on a Multi-Client Training Model. David incorporates tools such as Bosu, TRX, Cable Pulley systems, kettlebells, medicine balls and more, all around the Total Gym GTS centrepiece. He explains how he runs his Multi-Client Training sessions in a FREE online video on GRAVITY Clubhouse. We highly recommend you watch this for ideas. Click here to sign up for free: and then click on this link to go direct to ‘Mastering Multi-Client Sessions‘. This video in a nutshell teaches you the best ways to master Multi-Client sessions. So after breaking it down, you can see there are multiple approaches and opportunities within the concept of ‘Small Group Training’. From a business perspective, it’s the smart solution to training. Just be clear on how you position yourself and what you are offering.